We’d love your help. Let us know what’s wrong with this preview of Edward R. Murrow and the Birth of Broadcast Journalism by Bob Edwards. Get it, read it, and pass it on. --Bill Moyers""Most Americans living today never heard Ed Murrow in a live broadcast. This book is for them I want them to know that broadcast journalism was established by someone with the highest standards. Tabloid crime stories, so much a part of the lust for ratings by today's news broadcasters, held no interest for Murrow. He did like H Get it, read it, and pass it on. --Bill Moyers""Most Americans living today never heard Ed Murrow in a live broadcast. This book is for them I want them to know that broadcast journalism was established by someone with the highest standards. Tabloid crime stories, so much a part of the lust for ratings by today's news broadcasters, held no interest for Murrow. He did like Hollywood celebrities, but interviewed them for his entertainment programs; they had no place on his news programs. My book is focused on this life in journalism. I offer it in the hope that more people in and out of the news business will get to know Ed Murrow. Perhaps in time the descent from Murrow's principles can be reversed."" To ask other readers questions about Edward R. Murrow and the Birth of Broadcast Journalism, please sign up. It is discouraging to look at how far broadcasting has fallen from the first vision of Edward R. Murrow--who thought radio and television to should be an avenue to teach and inform the public. He was a man of integrity and was not afraid to stand up for what was right. He started to see the evolution of "commercial" broadcasting and tried to forewarn people that this would be the death of 'true' broadcasting. Edwards, Bob. (2004). Edward R. Murrow and the Birth of Broadcast Journalism. New Jersey: John Wiley & Son. “I’m standing on a rooftop looking out over London. At the moment everything is quiet. For reasons of national as well as personal security, I’m unable to tell you the exact location from which I’m speaking.” (Murrow, 1941). This is a direct quote from a broadcast Edward R. Murrow did when he was a correspondent for CBS. Bob Edwards used this quote in the introduction to his book Edward Edwards, Bob. (2004). Edward R. Murrow and the Birth of Broadcast Journalism. New Jersey: John Wiley & Son. “I’m standing on a rooftop looking out over London. At the moment everything is quiet. For reasons of national as well as personal security, I’m unable to tell you the exact location from which I’m speaking.” (Murrow, 1941). This is a direct quote from a broadcast Edward R. Murrow did when he was a correspondent for CBS. Bob Edwards used this quote in the introduction to his book Edward R. Murrow and the Birth of Broadcast Journalism, the focus of this review (Edwards, 2004). Once upon a time, way back when people had lives far simpler than today, people used to take the time it required to read. These people would read words. These words would form sentences. These sentences would themselves form paragraphs. Sometimes, unless the book was written for a young child to read, these paragraphs would form chapters. These words, sentences, paragraphs, and chapters would form the basis of what we call books. This might come as a shock to many people. To you, I say this: Open your minds to a life less ordinary. Read a book. There are many books and other writings, which talk about the life and career of Edward R Murrow with Bob Edwards adding to the existing works. The author has elaborated the journalist’s insight, brevity as it also compared the past with today’s happenings. There does not seem to be a maximum length for writers to adhere. Edward’s contribution to journalistic literature is no more than 200 pages in length. It is part of a series offering insight of world events that were covered by influential journalists (Cleary, 2004). Edwards, a former host of morning show in NPR, provides a comprehensive overview of contribution Murrow gave to journalism. One cannot cover very much in ten short chapters; however, with a painstaking consisnce, a high level of detail has been incorporated into what few pages there are. Please pay particular attention to Murrow’s days in radio during World War II (Murray, 2004). The book devotes chapter six to outline Murrow broadcast in Nazi concentration camp as chapter seven covers careers in television broadcast. (Cleary, 2004). Murrow evidentially got some of the internal issues discussed from his external news sources of information and informants. In spite the gloom and doom, each chapter has demonstrated Murrow’s personality, which is a dynamic trait as evidenced by the loyalty of “Murrow Boys.” It is these words, sentences, paragraphs, and chapters which show Murrow’s sense of humor, which is important in describing his character (Cleary, 2004). The afterwards for what was written provides perspectives on today’s broadcast news on the context of Murrow’s early work in the foundation of the profession as well as recruiting individuals who would dominate it. The book also assumes ways Murrow might work today with the current increases in limitations of corporate control. This provides and indicates the failure of transmission because of erosion of standards due to changes and regulations the government made in regard ownership. Each chapter, in its own way, has a natural flow to it. The writing itself, to a certain degree, is speculative. One could argue that this style of writing stems from the author’s experiences rather than that of the subject matter. The evidence supplied draws the reader’s attention to Murrow’s attention to the programming of public affairs. This programming was financially supported by Ford Foundation (Strout, 2010). Further, the book has a short bibliography and contains only twenty-three books than the rest of the book. It comprises of two works by Ed Bliss, Walter Cronkites and Edwards. Bliss has played a key role in ensuring this book develops making it a dedication to him and the wife (Cressman, 2006). Other inclusions in the book are three works of Cronkite and Fred Friendly with other three people who writes biographies of Murrow. Additionally, the book has four broadcast excerpts from a London rooftop of British bombing on Berlin. Edward R. Murrow and the Birth of Broadcast Journalism brings nothing new in the limelight or breaks a new ground. It only provides Murrow’s story to readers who are not able to read Murrow’s full-length biography (Cressman, 2006). It has managed to do this in an enjoyable and fashionable manner to the reader. The few bibliographical notes denote that the research done was not exhaustive, rather than a summary of the earlier works by other writers. In addition, the book traces the developments and the history of early innovations of Murrow triumphs, careers, and illness challenges faced in later life. It has played a vital function in communicating the subjects of Murrow’s programs and how the contents were manipulated as well as the consequences (Strout, 2010). The author asserts that someone looking for in-depth information and resources would rather look elsewhere than use doctored information. It has summarized the controversial program, “Harvest of shame” to one page (Cleary, 2004). The economy of language makes this book an excellent supplemental reading for any student taking a course in mass communication. It represents and paints a vivid picture in gathering and reporting news. Reading all this will equip students with information and understanding about the developments of mass communication as well as broadcasting journalism. Furthermore, instructors and lecturers must emphasize the relationship between the author and the influential former professor’s friend, Ed Bliss since he was a friend to Murrow. This acts as a cautionary tale for methodological reasons. The book is important for current students taking broadcast journalism because it will make them gain appreciation on ways short form broadcaster translated tom print media. Cressman, D. L. (2006). Review And Criticism: Book Review—Edward R. Murrow and the Birth of Broadcast Journalism. Journal Of Broadcasting & Electronic Media, 50(1), 160-161. Murray, M. D. (2004). Edward R. Murrow and the Birth of Broadcast Journalism (Book). American Journalism, 21(3), 113-114. Murrow, Edward R. (1941). This is London. New York: Simon & Schuster. Smith, D. (2004). Edward R. Murrow and the Birth of Broadcast Journalism (Book). Library Journal, 129(8), 122. This book was written by Bob Edwards and chronicles the life of the famous radio and TV news journalist: Edward R Murrow. A little background – I grew up listening to the famous record series “I Can Hear It Now (1933-1945)“. I’m not sure why my mom bought them for me as a child, but I have distinct memories of listening to these albums (actually, 78rpm LPs, as in “Long Playing” for all you music streamers) along with my copy of “The Lone Ranger“. Incidentally, anyone interested can hear much of, This book was written by Bob Edwards and chronicles the life of the famous radio and TV news journalist: Edward R Murrow. A little background – I grew up listening to the famous record series “I Can Hear It Now (1933-1945)“. I’m not sure why my mom bought them for me as a child, but I have distinct memories of listening to these albums (actually, 78rpm LPs, as in “Long Playing” for all you music streamers) along with my copy of “The Lone Ranger“. Incidentally, anyone interested can hear much of, if not all of, the records on YouTube. You can certainly hear enough of Murrow’s voice to appreciate what he sounded like to Americans who were just discovering radio. The beauty of this audio set is that the voice of Edward R Murrow is liberally sprinkled throughout the performance and the book is read by its author. Considering the huge impact Ed Murrow had on broadcast journalism, it is shocking to find out that he died right after celebrating his 57th birthday. At its inception, radio was a medium that offered live broadcasts as well as other entertainments. However, Murrow thought it was important (in the 1930s & 1940s) to explain to unconcerned Americ The beauty of this audio set is that the voice of Edward R Murrow is liberally sprinkled throughout the performance and the book is read by its author. Considering the huge impact Ed Murrow had on broadcast journalism, it is shocking to find out that he died right after celebrating his 57th birthday. At its inception, radio was a medium that offered live broadcasts as well as other entertainments. However, Murrow thought it was important (in the 1930s & 1940s) to explain to unconcerned Americans what was really going on in Europe, leading up to and during World War II. Murrow unmasked Senator McCarthy to the American public. However, Murrow fell to corporate politics and the rating games at CBS. I listened to the audio version, read by the author. I’m glad I did, as it included actual audio of some of Murrow’s work. While reading the book would have been quite wonderful on its own, hearing the man added something extra to the experience. After reading "Suspect Red" by l.M. Elliott, I wanted to read more about Edward Murrow and others of that time period. This book did not disappoint. Great picture of the journalist and of his times. Wonderful, quick read that makes me appreciate my husband's job and the mid-20th century history. I also understand the movie "Good Night, and Good Luck". I hope my kids read this book someday. I share a lot of Murrow's values. Well written and well researched book on the beginning of broadcast journalism. I remember "See It Now" and Morrow on TV. This was a very interesting book! The audiobook contains extended portions of some of Murrow's classic broadcasts, in the flow of the narrative. It's a welcome enhancement to the experience. Good. Although one-minute biographies are usually readable, they rarely meet this standard. Murrow had a fascinating life-story, even if the effect of his example has led to a raucous mob of imitators. The split-screen interview and a variety of other design patterns are still there, yet to be improved upon. It was a choice between this and A.M. Sperber's 795 page tome. I'm interested in Murrow, but not enough to commit myself to reading the latter, not just yet anyway. This is unfortunate because Edwards' biography on Murrow really contains nothing more than the amount of information that watching Good Night, and Good Luck, or reading the Wikepedia entry on him has to offer. The writing is pretty bland and humorless, and even though he manages a concise enough account of Murrow's career, a lot of i It was a choice between this and A.M. Sperber's 795 page tome. I'm interested in Murrow, but not enough to commit myself to reading the latter, not just yet anyway. This is unfortunate because Edwards' biography on Murrow really contains nothing more than the amount of information that watching Good Night, and Good Luck, or reading the Wikepedia entry on him has to offer. The writing is pretty bland and humorless, and even though he manages a concise enough account of Murrow's career, a lot of information still seems omitted here. 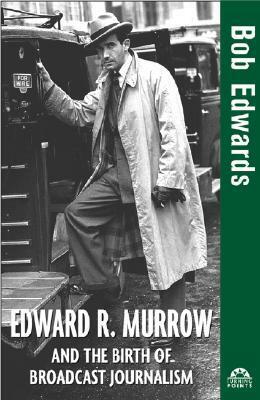 Murrow was tackling some controversial issues and stories, while spearheading innovative ideas and approaches to radio and television journalism; these events need more elaboration, and Edwards' book is just too brief. The afterword to this biography is slightly more inspired. Although the fanatical tone makes it sound like a gushy rant about someone who Edwards thinks is an American hero. I mean, he is, but I feel that most biographies should either stylistically strive to capture the personality of the figure, or offer a dry recapitulation of their life and times. This book does neither, and it reads like one of those young-adult bios. It does, however, contain the famous 1958 RTNDA speech, which I feel is a great introduction to Murrow's integrity and brilliance. I was prompted to read this book after hearing an interview with Bob Edwards on "The Daine Rheem Show". It is a small book but triggers much thought. I knew little about Murrow at the start. In terms of learning about the man and his impact on broadcast journalism, this was a fabulous book. What a figure! I also knew little about the history of broadcast journalism, though I have watched the changes during my adult life. I learned a lot about that as well, and the last 10 pages or so chronicle t I was prompted to read this book after hearing an interview with Bob Edwards on "The Daine Rheem Show". It is a small book but triggers much thought. I knew little about Murrow at the start. In terms of learning about the man and his impact on broadcast journalism, this was a fabulous book. What a figure! I also knew little about the history of broadcast journalism, though I have watched the changes during my adult life. I learned a lot about that as well, and the last 10 pages or so chronicle those recent changes and provide an understanding of the reasons for them. At first I was disappointed in the writing style of Edwards, a lot of "history" as chronological fact. But the style shifts, further into the book, as the man Morrow is more a central figure in the development of broadcast journalism. It became more compelling for me. And in the final pages, Edwards does not hesitate to add perspective and commentary, which I appreciated. Very surprised to learn that Edward R. Murrow, that paragon of ethical behavior, repeatedly lied on his job applications. This led to some dilemmas, such as when a women's college invited him to be its president and then found out that he not only didn't have a master's degree but was also only 26. Also surprised to learn that he integrated a national student government awards dinner 34 years before segregation was outlawed. The hotel managers refused to serve African Americans, so the white dine Very surprised to learn that Edward R. Murrow, that paragon of ethical behavior, repeatedly lied on his job applications. This led to some dilemmas, such as when a women's college invited him to be its president and then found out that he not only didn't have a master's degree but was also only 26. Also surprised to learn that he integrated a national student government awards dinner 34 years before segregation was outlawed. The hotel managers refused to serve African Americans, so the white diners received the plates and passed them to the black people, which the hotel staff thought was hilarious. This is a sweet little book by Bob Edwards that reminds us that broadcast journalism was not inevitable. Edward R Murrow invented it -- from the rooftops of London during the blitz to McCarthyism, ERM brought the world into homes -- first radio, then television, often brutally unfiltered. My favorite part of this book was the afterword where Edwards muses on how ERM would react to broadcast journalism today -- when news programs' successes are measured by profits, where there is so much sensatio This is a sweet little book by Bob Edwards that reminds us that broadcast journalism was not inevitable. Edward R Murrow invented it -- from the rooftops of London during the blitz to McCarthyism, ERM brought the world into homes -- first radio, then television, often brutally unfiltered. My favorite part of this book was the afterword where Edwards muses on how ERM would react to broadcast journalism today -- when news programs' successes are measured by profits, where there is so much sensationalism, and where the concept of "breaking news" has totally lost its meaning. Needless to say, he concludes that Murrow would be pretty disappointed if not outraged. Edward R. Murrow reported live the bombing of London. He took on Senator McCarthy in a television broadcast. He pioneered broadcast journalism on the radio and the television. This was a short biography and introduction to his work. Why I started this book: I found this audio while I was shelf-reading and remembered Murrow's name from my time volunteering at the Newseum in DC. Thought it would be a great book to kick start some nostalgia. Why I finished it: Very basic introduction, but I loved tha Edward R. Murrow reported live the bombing of London. He took on Senator McCarthy in a television broadcast. He pioneered broadcast journalism on the radio and the television. This was a short biography and introduction to his work. The book serves as a very good introduction to Edward R. Murrow and his legacy as a founder of radio and television broadcasting. Bob Edwards is a modern interviewer on public radio and clearly respects the groundbreaking path that Murrow provided for him. The Afterword of the book is particularly excellent, with Edwards' voice coming through examining the legacy of Murrow being corrupted by cable news and television as primarily an entertainment medium. A. M. Sperber's monumental (752 pages) biog The book serves as a very good introduction to Edward R. Murrow and his legacy as a founder of radio and television broadcasting. Bob Edwards is a modern interviewer on public radio and clearly respects the groundbreaking path that Murrow provided for him. This is a great book for understanding how journalism is meant to be. It reads like it's written by a broadcast journalist (spare and informative) which it was. It shows the heroics of Murrow and his associates during wartime and their bravery in spite of powerful forces working against the truth. Edwards has a great chapter on understanding the current state of journalism and how to wade through the noise to reach the truth. Short and sweet bio of Edward Murrow. I grew up listening to "I can hear it Now" records. It is from these recordings and other things that I get my love of history. I admire this man's pioneer spirit. He was a trailblazer. And he was blessed with a name like Egbert. Bob Edwards never addresses how Egbert became Ed, but he does give an interesting take on modern journalism and how Ed/Egbert would not be a happy anchorman in our days of "fair and balanced" journalism. Another audoiobook, and Bob Edwards reading of his own material, interspersed with Murrow's actual recordings, is very well done. Murrow is so obviously a player character, accomplishing so much during his life that it's hard not to feel just a week bit inferior. I strongly recommend listening to it. I was very excited to read this book, having been a journalism student. However, this book was little more than, "Golly gee, isn't Ed Murrow great?" Sure, but I'm sure his story is more nuanced than that. The best part about this book are the passages that transcribe Murrow's broadcasts. I am disappointed that this book had so little to offer. I confess: I'm a "newsie". I love to watch, read and listen to the news. This biography was irresistible and after watching "Good Night and Good Luck", well, I couldn't wait to read this. As so many other geniuses who have changed the world, definitely a flawed and complex soul living in extraordinary times. A great read for history buffs and journalism buffs alike. A fast read too. What a wonderful book. I loved it. Edward R. Murrow is the great example of independent journalism, untainted from money. I loved the Afterword by Bob Edwards. I downloaded it from audible.com. It was great to hear the actual voice recording of Murrow. Edwards did an amazing job of telling the tremendous influence that Murrow had on journalism. The small biography is packed full of names in the broadcasting field, all influenced or even hired by Edward R Murrow. Everyone in my book club loved it. There was a time when television was the "New Media" and Edward R. Murrow was on the scene molding the future of television news. He laid a great foundationa nd Bob Edwards does a great job of telling the story. Too bad the 65 cigarettes a day habit took the life of this pioneer broadcaster. Most of the book was a review of the highlights of Murrow's career, but Edwards emphasizes Murrow's desire to educate through media. Edwards himself would prefer that news help us learn about both sides of an issue, make us think. Oh the joy of learning about a quality news reporter - someone of honesty and high standards. Yes, there once were such reporters of the news - people who reported facts and did not belittle others or holler. For those interested in real news, this is a must read. I enjoyed this, I have respect for those who had respect for those who felt that way. Too bad that intellect is long gone.